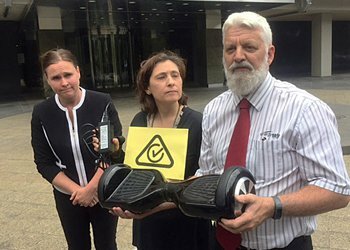 Some dickheads in Victoria tried to ban hoverboards last week. And it’s not like you might think. It’s not because they don’t actually hover. It’s because they burst into flames. These dickheads get to say stupid things like this because they’re elected to parliament. Once in government saying stupid things is pretty much mandatory. How else are you meant to maintain your media profile? Say something clever? Who would listen. They want a law banning these things because one caught fire in Strathmore and burned down a house. Hoverboards the world over have been combusting and burning stuff to pieces, according to the news. In Australia you have to make sure your electrical stuff is certified and meets Australian standards if you want to sell it in Australia, just to prevent that stuff burning houses down and the like. This hoverboard in Strathmore did not have that certification. And not without coincidence it caught fire and burned a house to pieces. You could pass a law against selling stuff without proper certs but there already exists such a law, which makes it difficult for dickheads in parliament to look like they’re doing anything. So obviously they ban everyone in all of Australia from owning a small harmless device rather than enforce the existing law. But so long as we’re all laughing who cares. Hoverboards are also called Segway boards, which is awesome because Jim Heseldon, the inventor of the Segway, died when he rode his Segway off a cliff. Removing the steering column from a Segway may seem like a stroke of genius but when you consider what happened to Jim you have to wonder if we needed to make Segways more difficult to ride. Anyhoo. Let people find their own best way of hurting themselves. I clipped a pedal mountain biking yesterday and went over the bars. Who am I to tell people how minimize risk? The argument from those who oppose hoverboards, riding without a helmet, talking back to your wife, or any kind of risk whatsoever, is that these things can lead to accident and death. And one death is one too many. I heard this nonsense on talk-back radio the other day applied to bicycle helmets. If the world was an incredibly simple place with purely linear and isolated results from any given action then I’d agree with over-simplified rhetoric like this. Problem is the world is a much more complex place than politicians and talkback callers would like to think. Did helmet laws save as much as one life per year? Did the resultant decline in bicycle use contribute to the diseases of affluence that afflict Australians? Was the net result a saving of lives or a loss of lives? One is too many. We can agree on that right? Yes. One toddler drowns in a pool. Everyone gets pool fences. One head injury, everyone gets helmets. One man talks back…no forget that, I’ve already pushed that pun past its acceptable use. One man falls out of a boat, everyone gets life jackets. So what about the 1,300+ people who died on Australian roads last year? Was that too many? It’s a lot more than one? Should we ban cars? Encourage transport alternatives? Give bicycle riders a leg-up with enlightened policy? In NSW last year there were over 13,000 road trauma casualties reported to hospital. That’s a shitload more than one and, as you could expect, NSW government did what governments do. Something stupid. They massively increase fines against cyclists for minor infringements. Like running a red light. As someone who pretty much accepts running red lights as his natural right as a cyclist, it’s a concern that NSW government morons are cracking down on this stuff. If I wanted to get caught in traffic I’d drive a bloody car. The government did throw us a bone in the form of metre wide passing rules. We have these in Queensland now too. They’re a good idea. They made people more aware of the space a cyclists requires. Of course, same week those laws came in I had a car drive down the footpath toward me. The path was only about a metre wide so I’m not sure how the laws would have applied there.